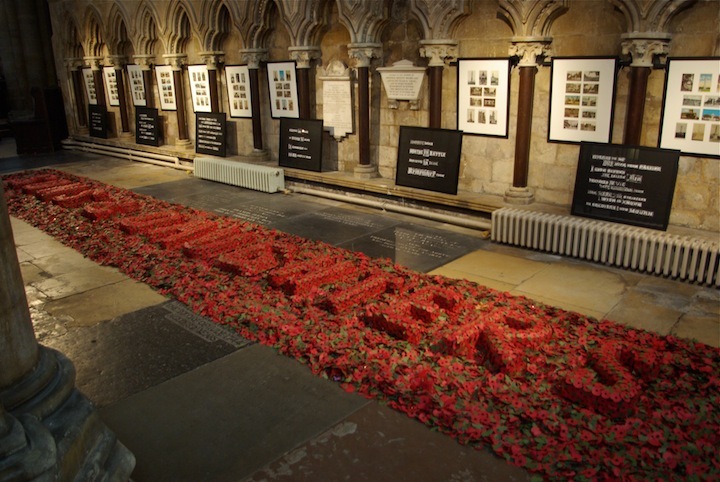 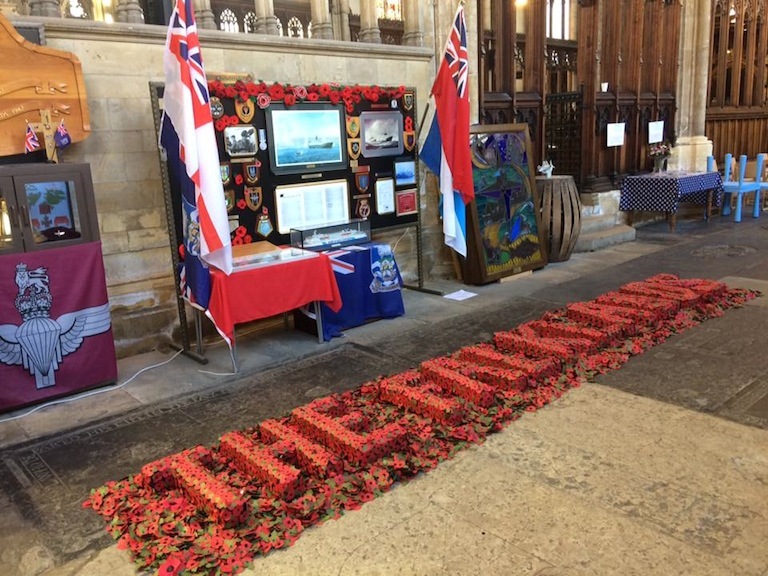 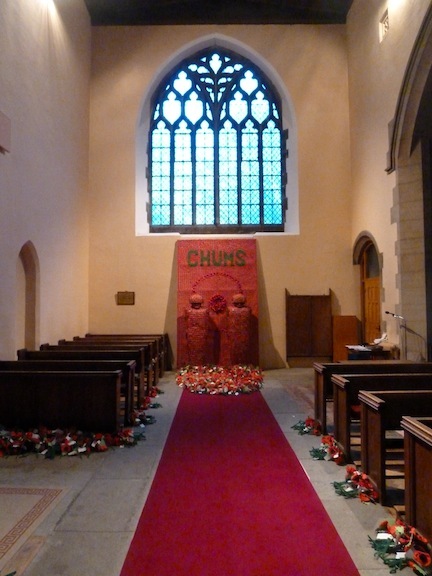 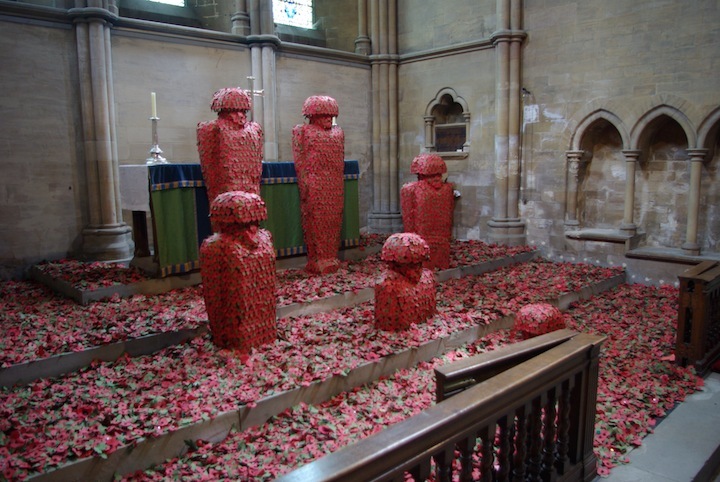 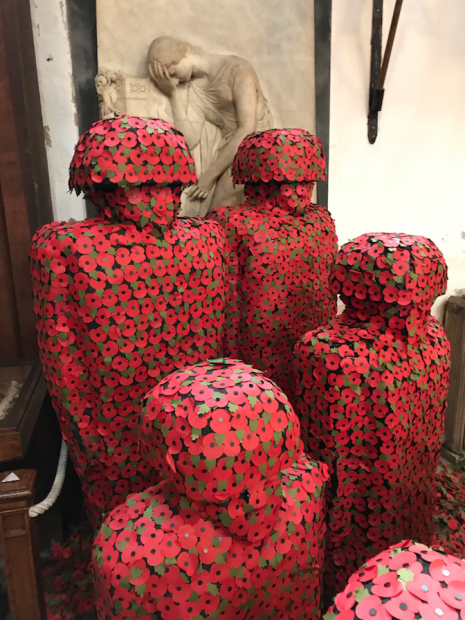 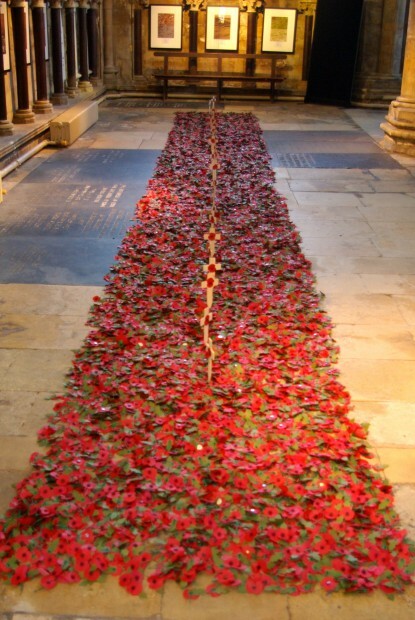 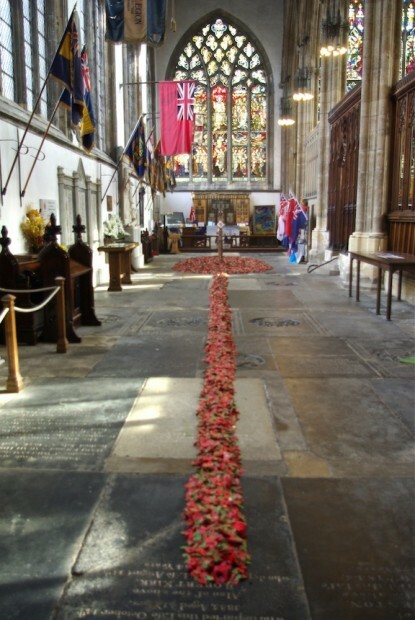 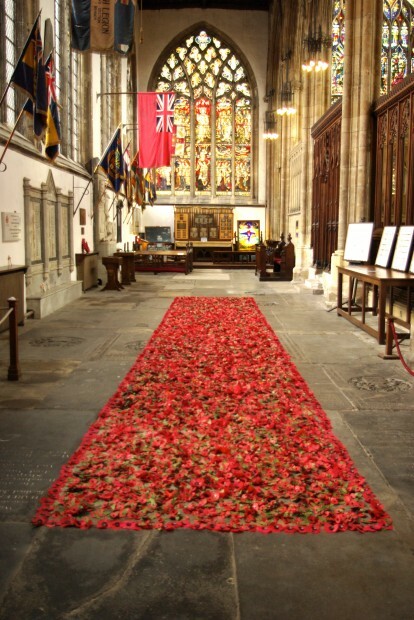 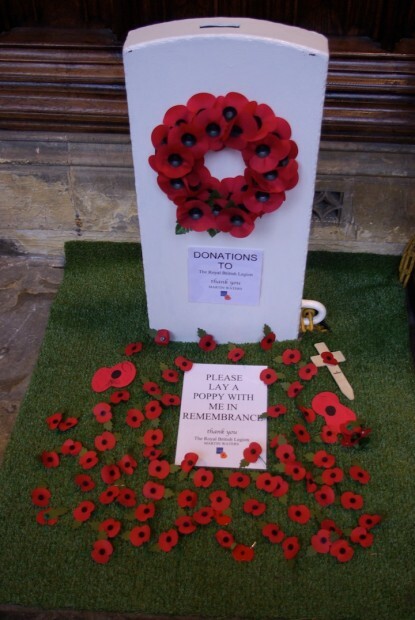 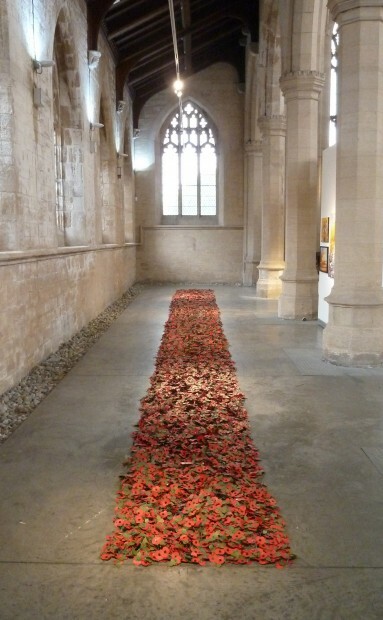 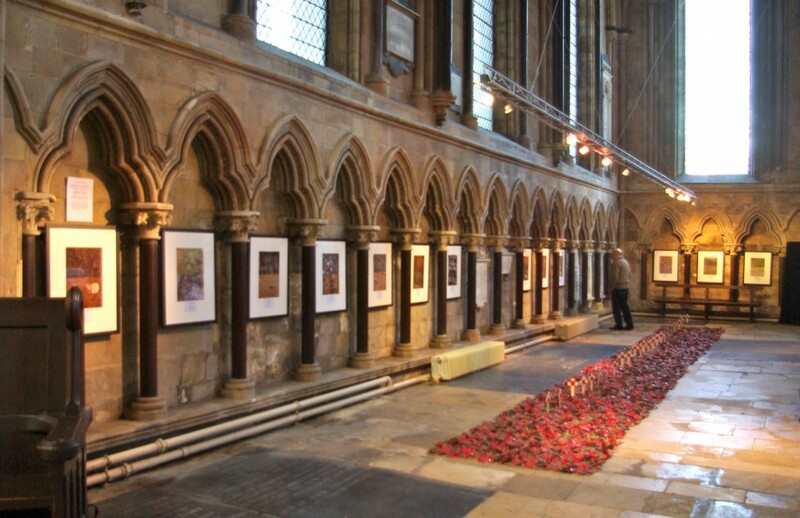 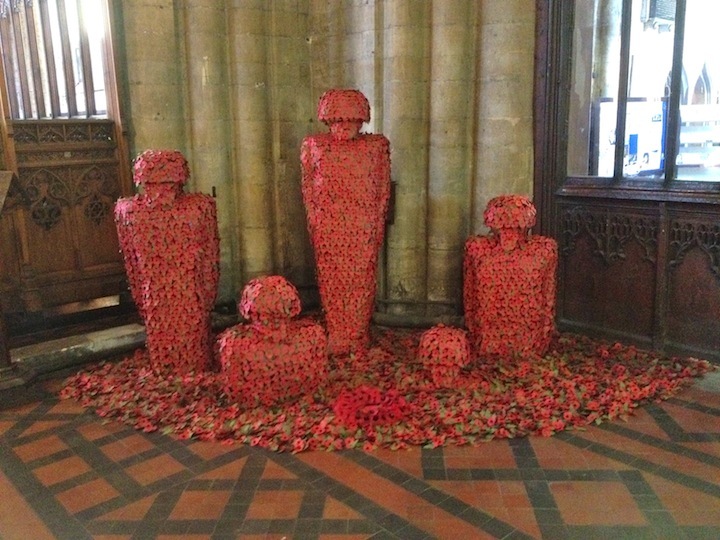 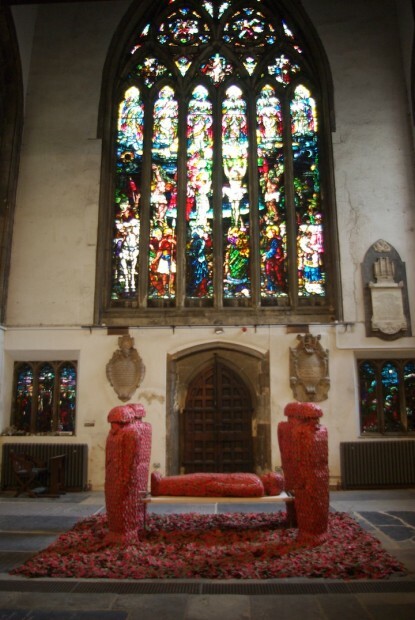 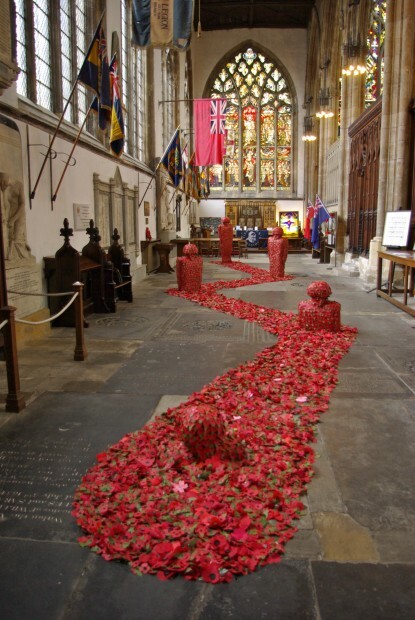 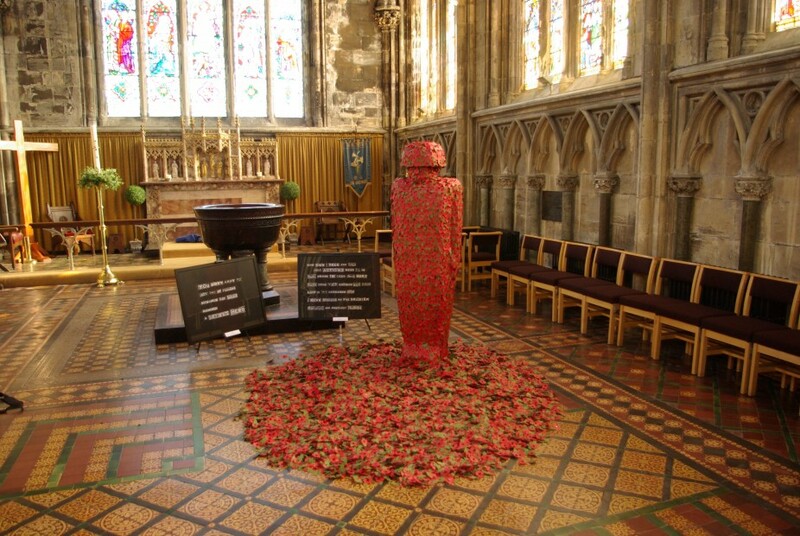 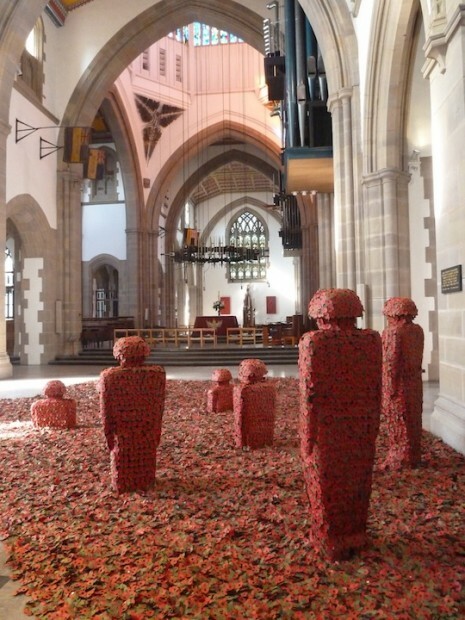 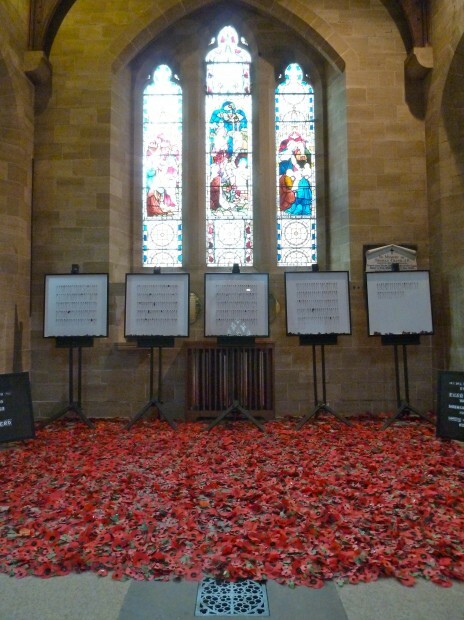 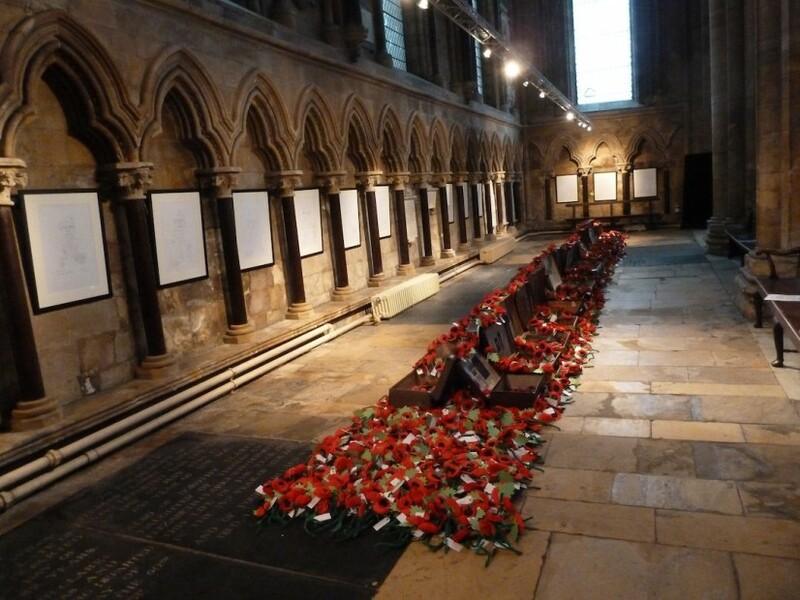 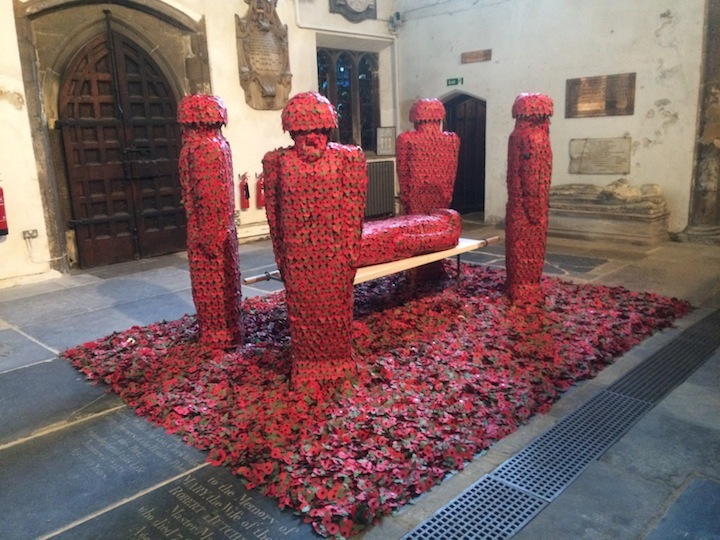 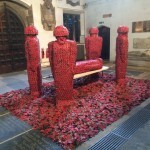 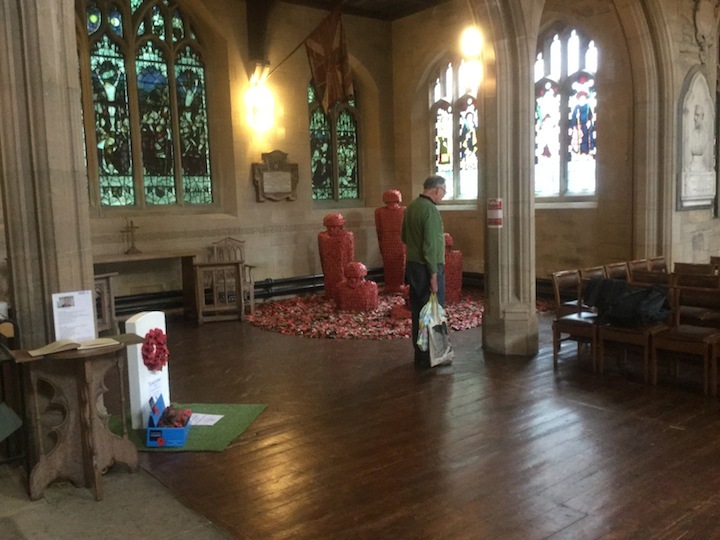 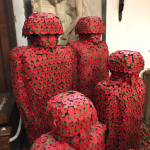 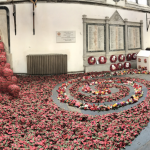 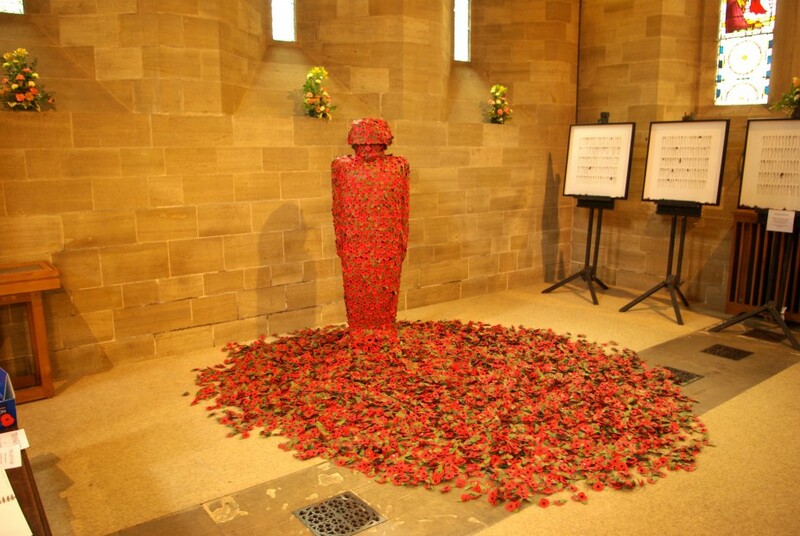 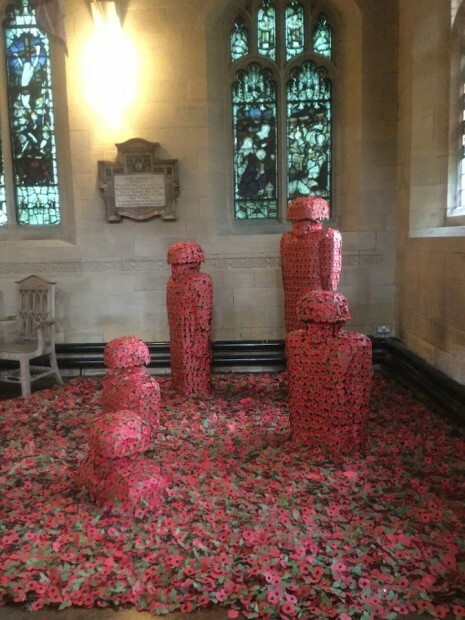 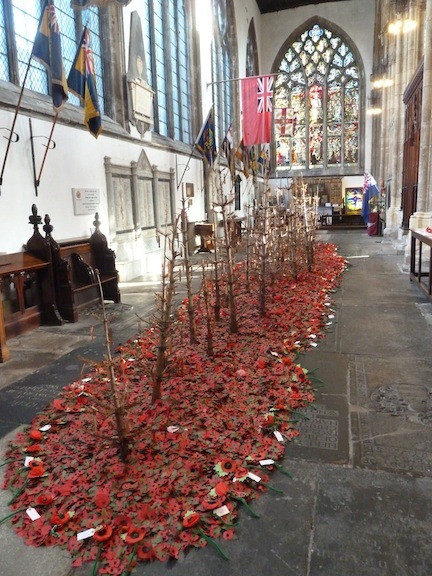 The thousands of Red Remembrance Poppies were collected, with the help of many donations, for the Poppy Installations at Holy Trinity Parish Church, Hull and the North of England from 2011 to 2018. 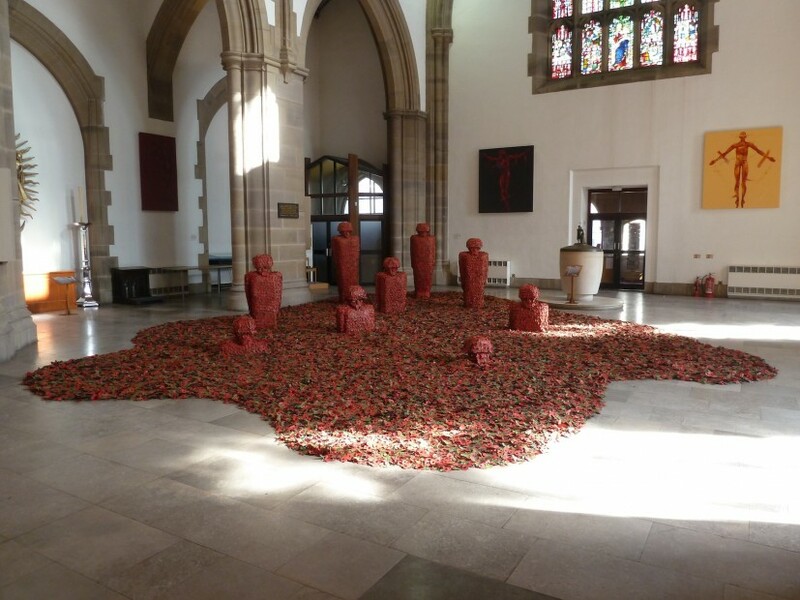 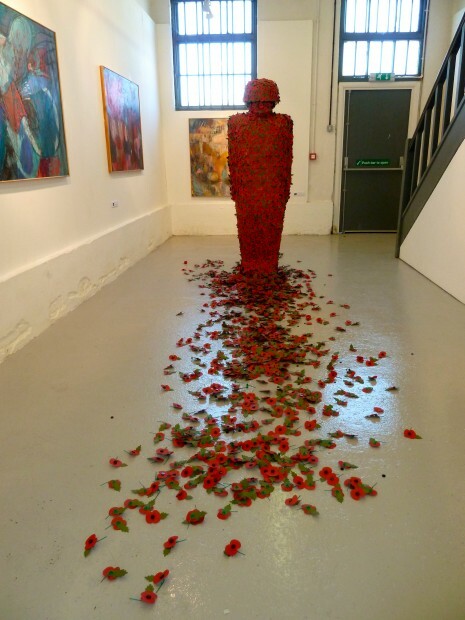 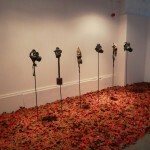 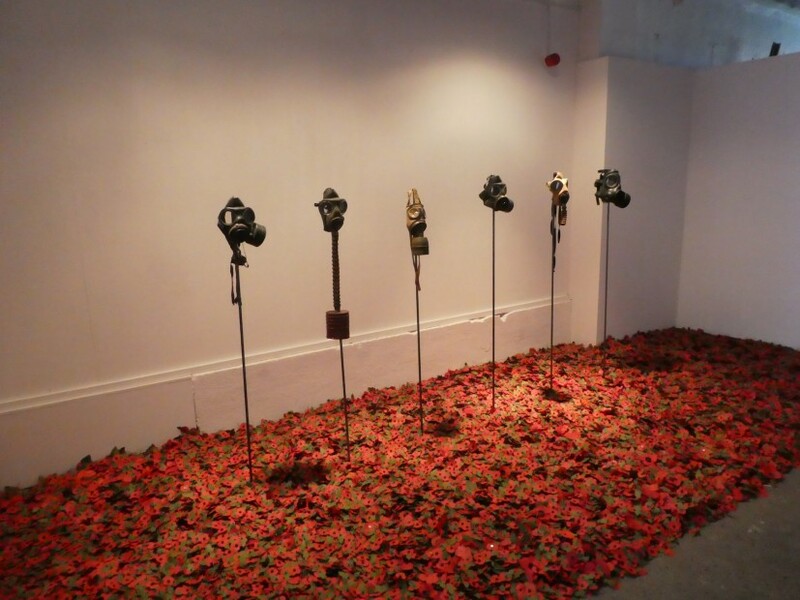 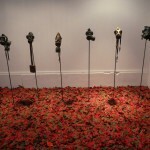 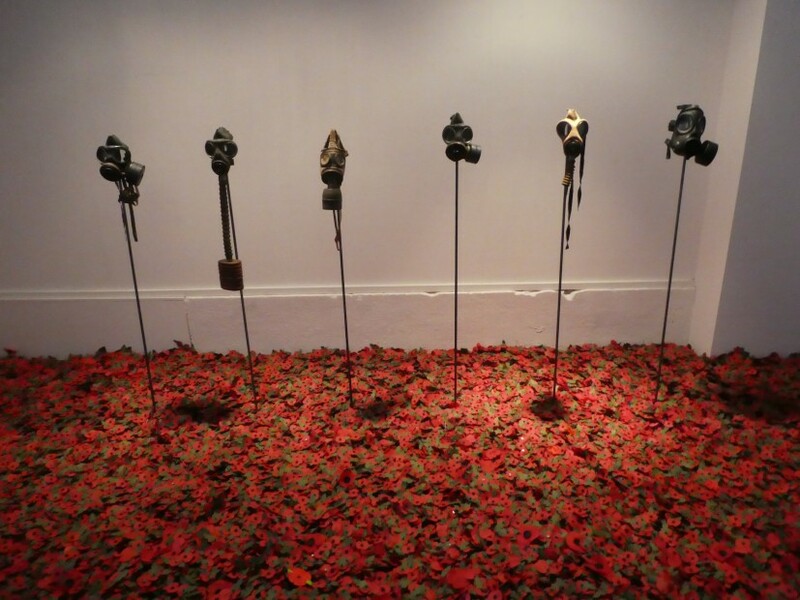 These installations are in response to my feelings towards war and remembrance.I wanted to create something large enough to describe the immense empathy people have towards those killed in or as a result of war and conflict past and present, including civilians. 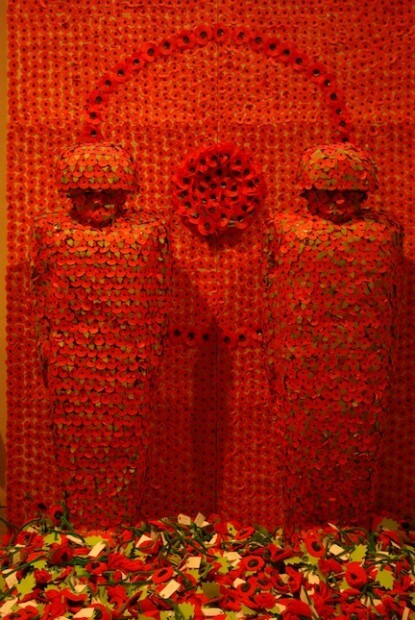 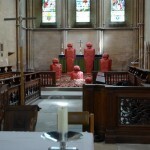 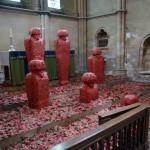 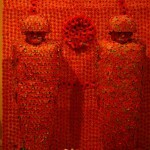 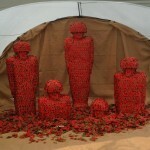 I wanted to emulate the poppies growing in the fields of Flanders after the battles of the First World War. 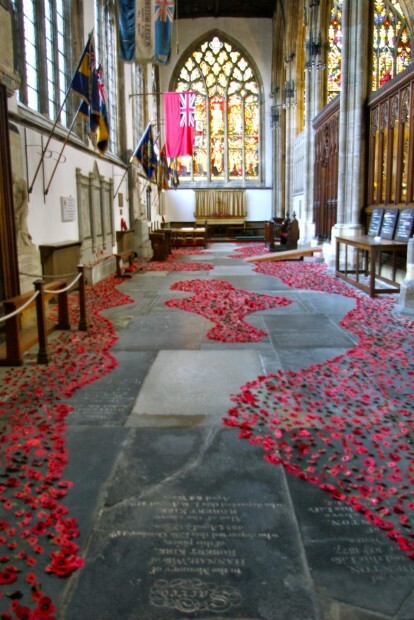 As I walk through the beautiful buildings the words of the old memorials echo in my thoughts, solemn, sad yet heroic and commemorated, lost but still loved. 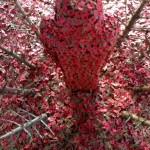 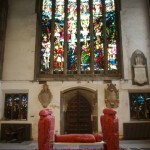 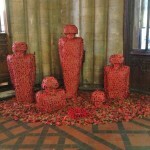 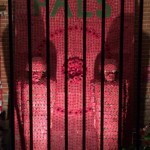 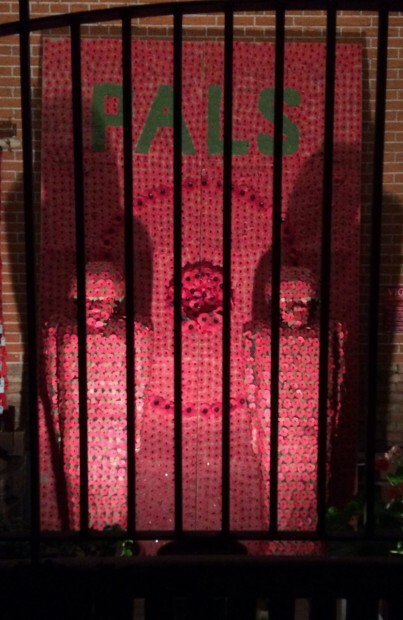 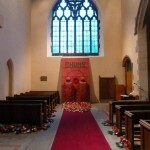 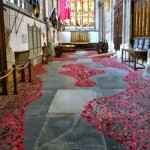 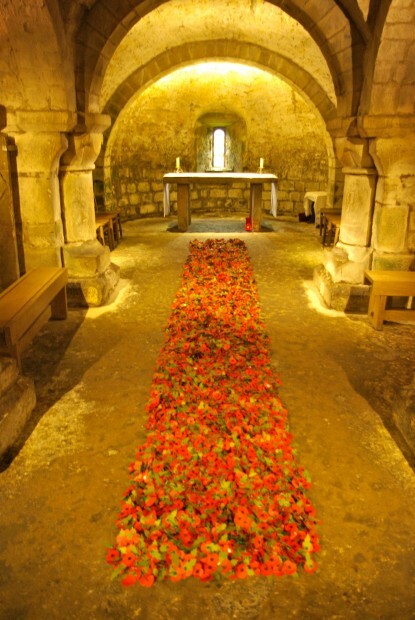 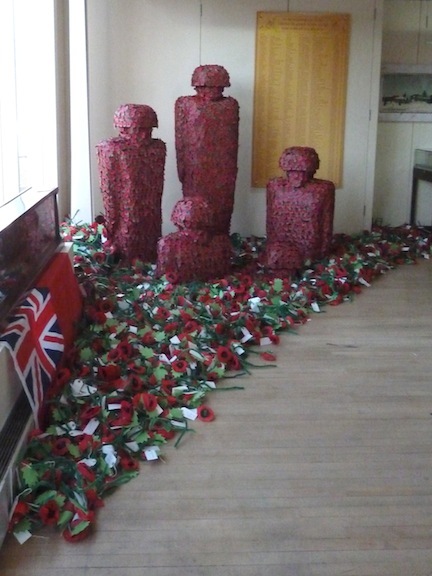 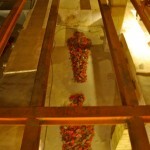 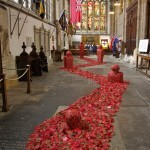 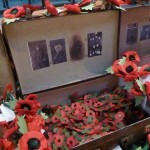 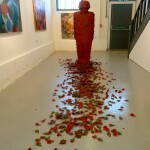 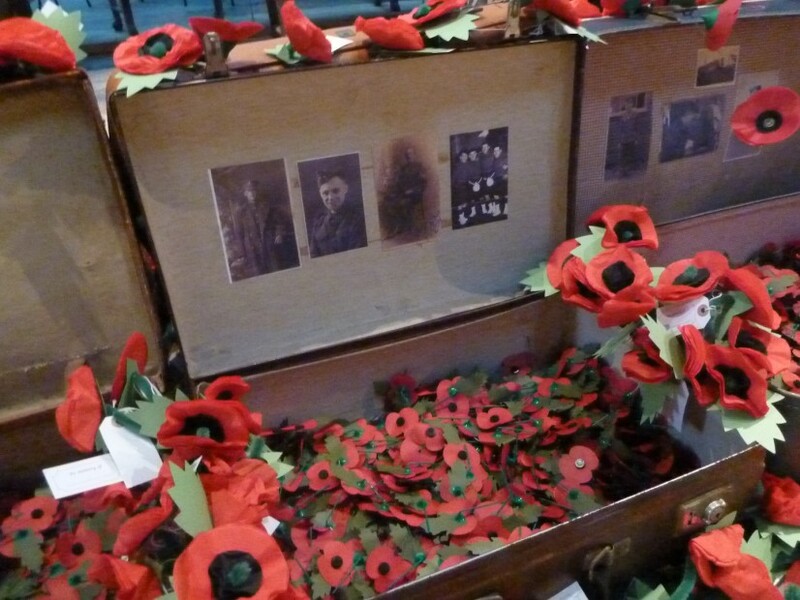 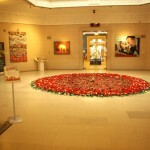 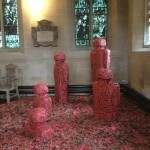 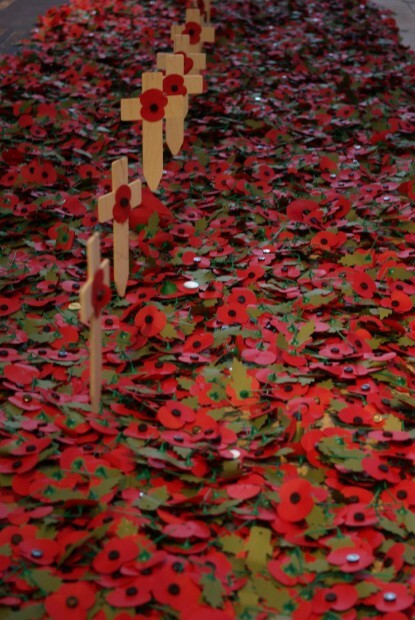 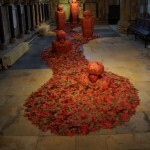 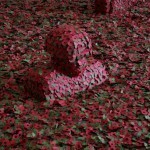 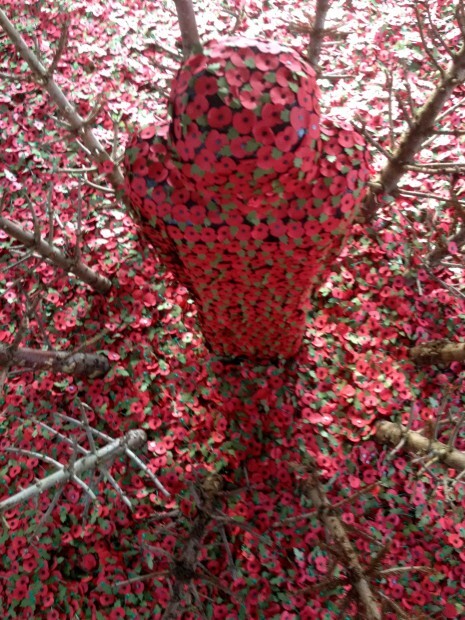 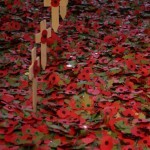 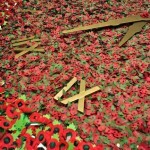 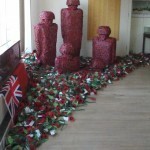 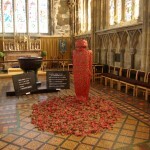 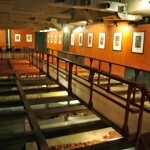 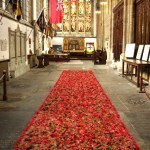 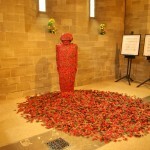 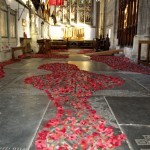 Please feel free to add your own red remembrance poppy to the installation. 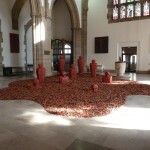 LOST - Martin Waters 2014. 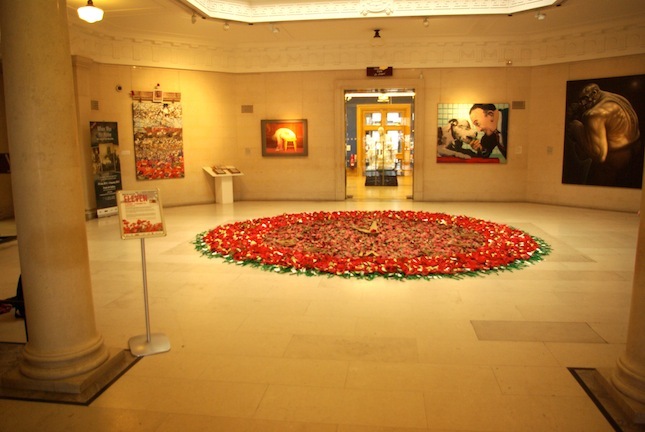 ELEVEN - Ferens Art Gallery 2014. 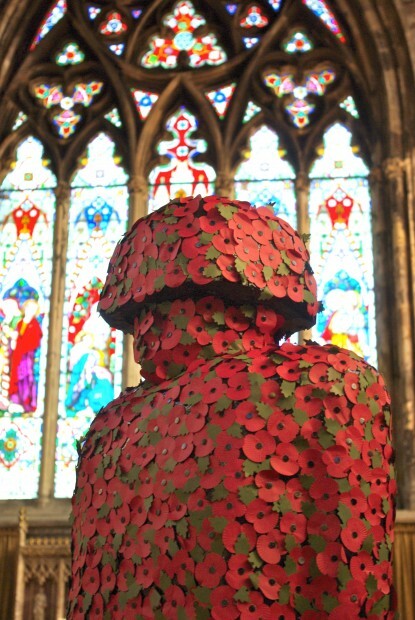 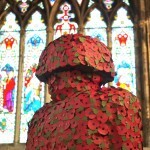 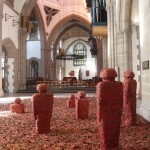 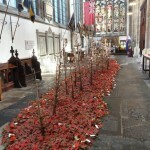 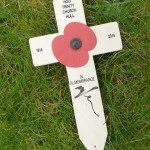 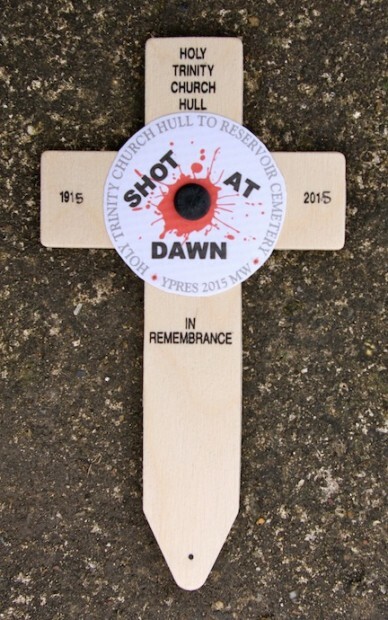 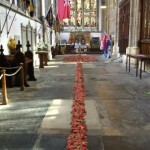 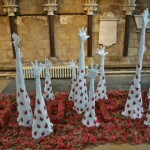 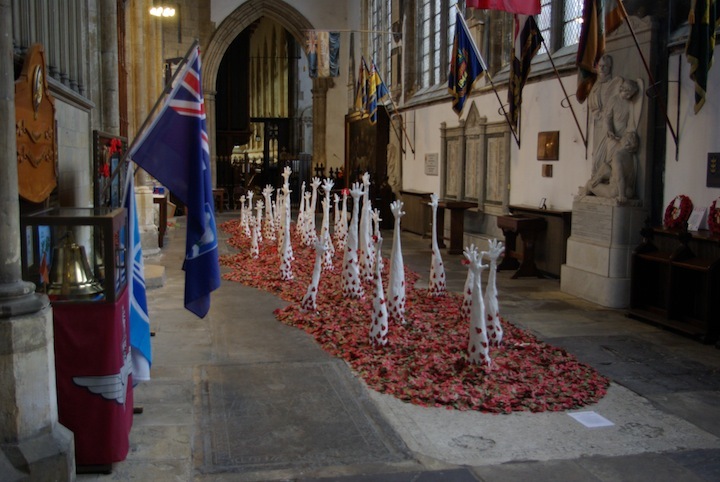 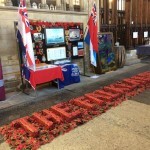 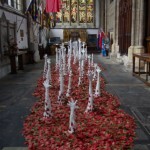 Poppy Cross Installation on the Visit by Holy Trinity Church, Hull. 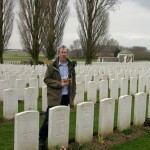 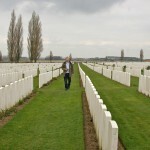 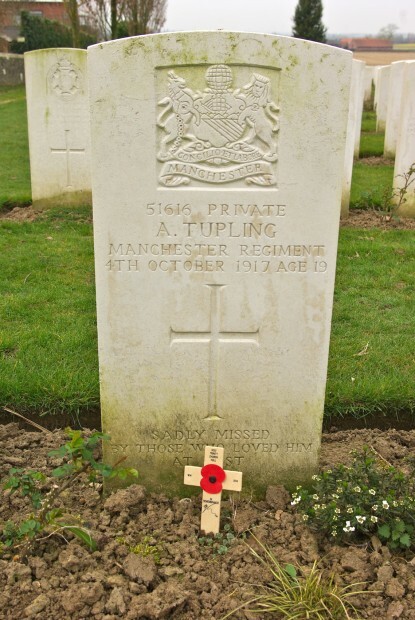 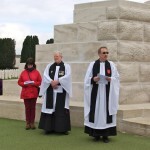 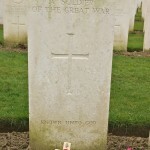 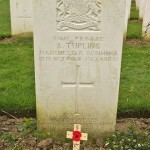 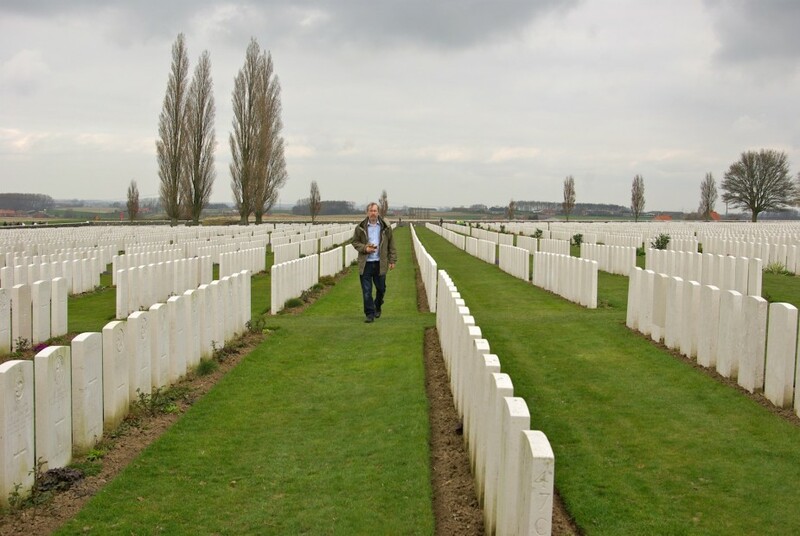 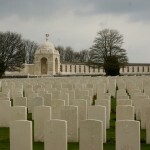 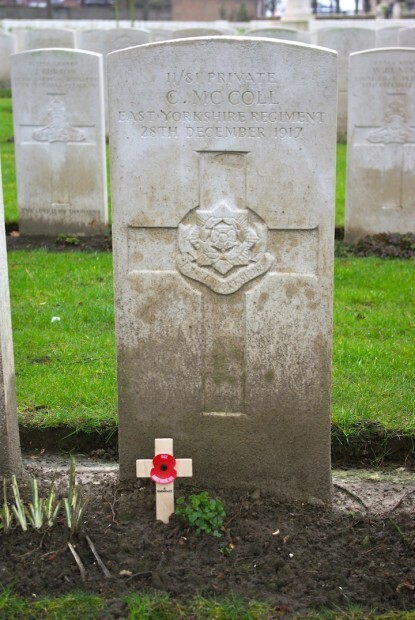 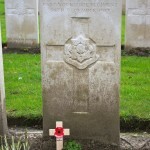 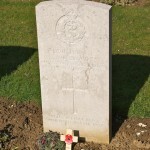 Private Albert Tupling – 51616, a Hull man, who served with the 22nd Battalion of the Manchester Regiment and died on the 4th October 1914 aged 19 years, is buried at Tyne Cot Cemetery, Zonnebeke.Knowing something of Albert’s history made the experience much more relevant and vital, a real man not just a number. 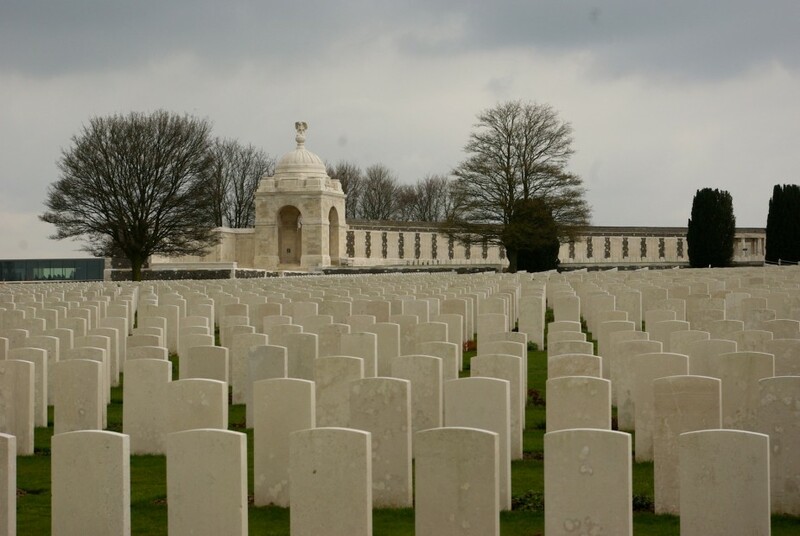 For me, the cemetery had an aura of calmness and peacefulness, an overwhelming sense of sadness for the millions of the deaths that occurred in World War 1, 11956 men are buried and remembered there. 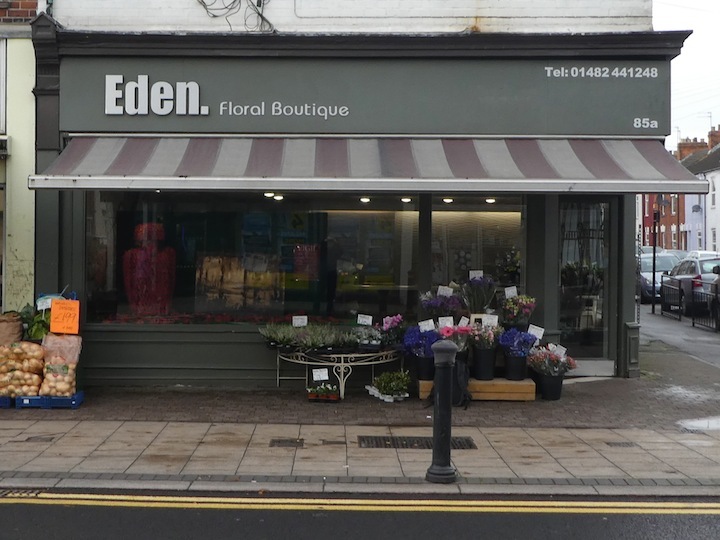 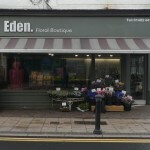 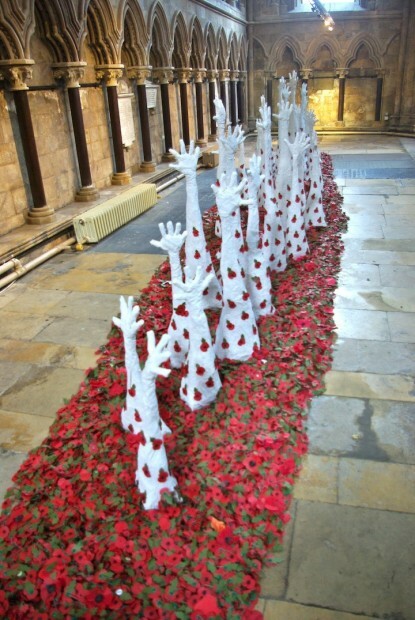 Creating an artwork in a public place should be relevant, unobtrusive and blend into the landscape. 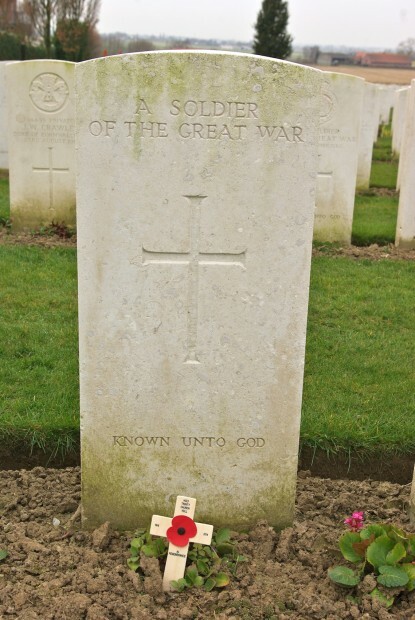 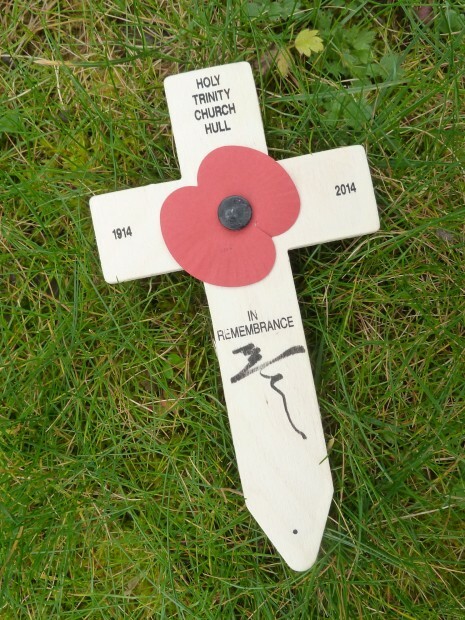 50 poppy crosses were placed at the headstones of 8 Hull soldiers whose graves are marked with their names and the graves of Unknown British Soldiers picked at random by the visiting Holy Trinity Parish Church Group. 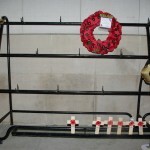 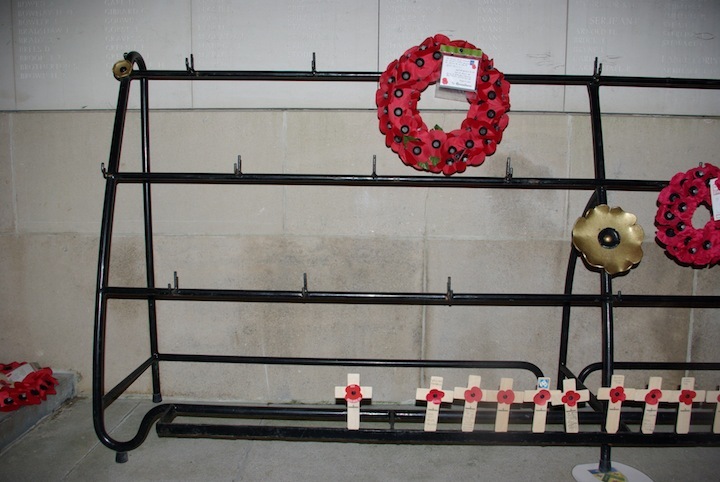 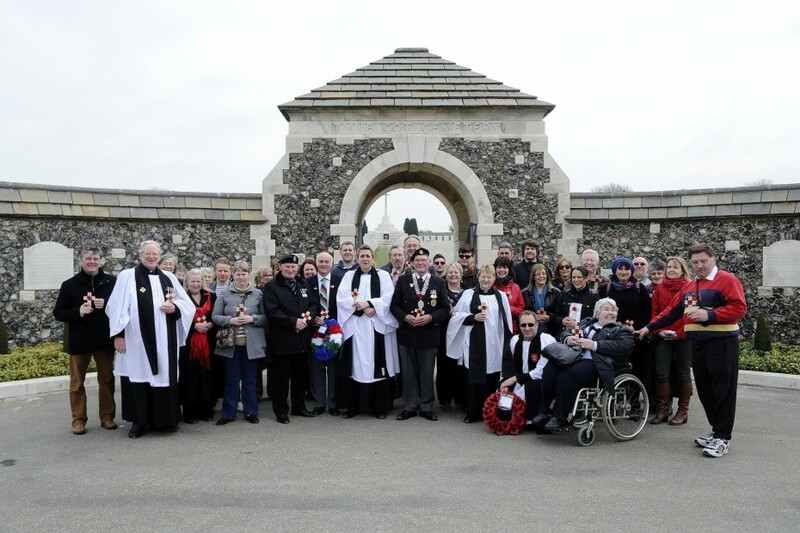 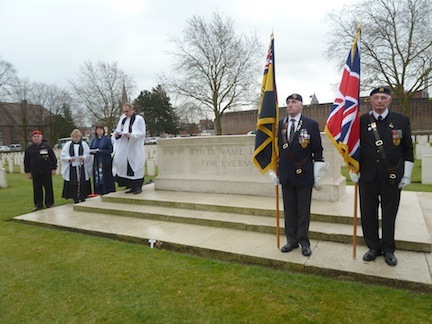 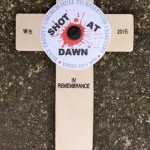 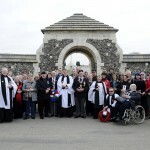 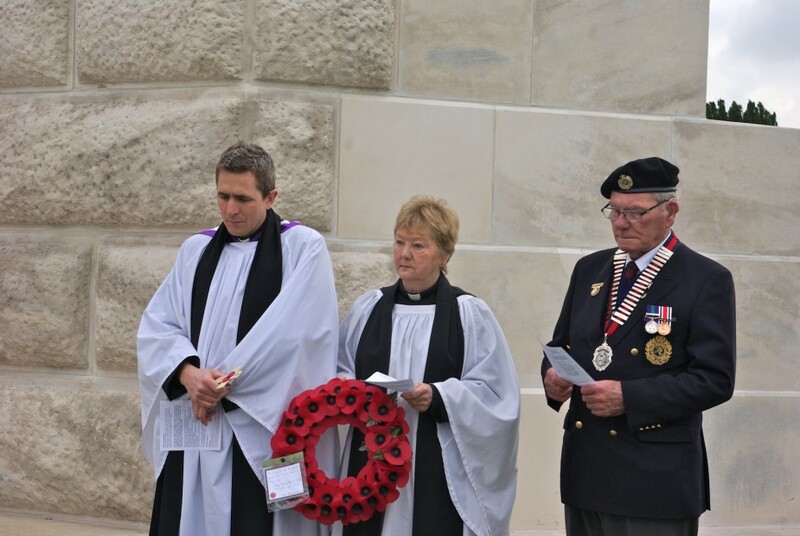 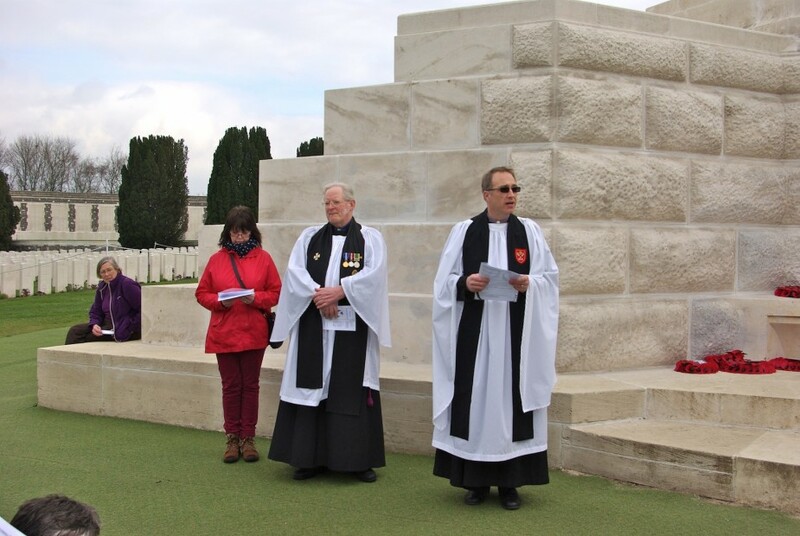 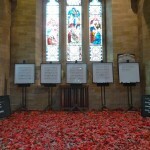 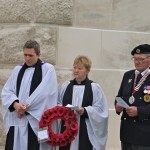 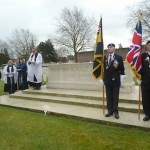 The crosses were personalised with messages from the individuals in the group, wreaths were laid at the Cemetery Cross of Sacrifice and a service of remembrance given by the Vicars and Ex-servicemen. 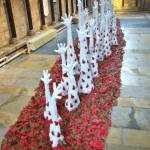 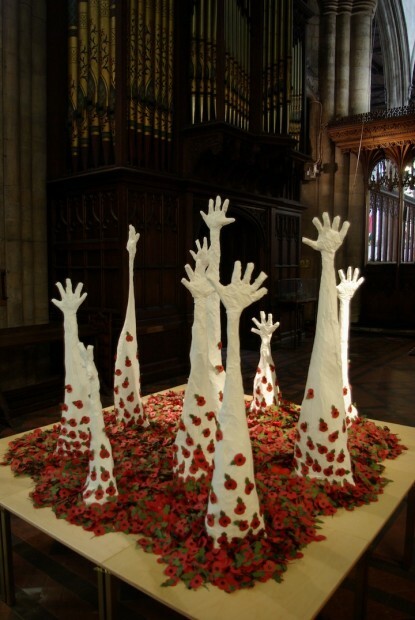 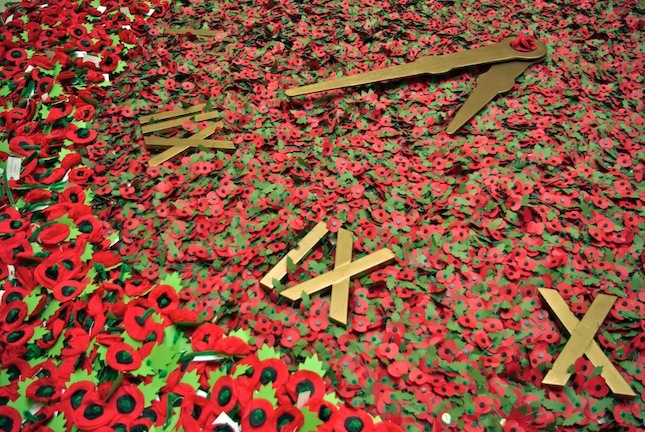 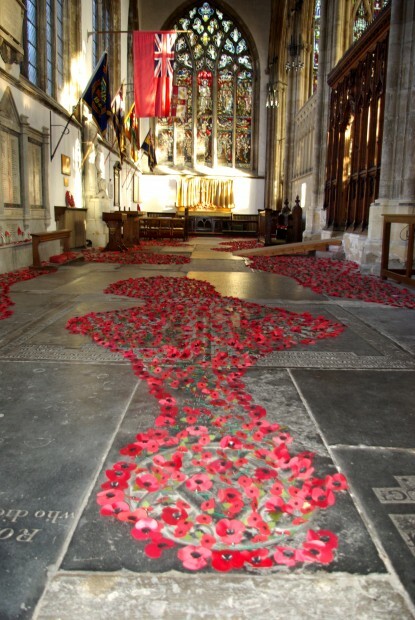 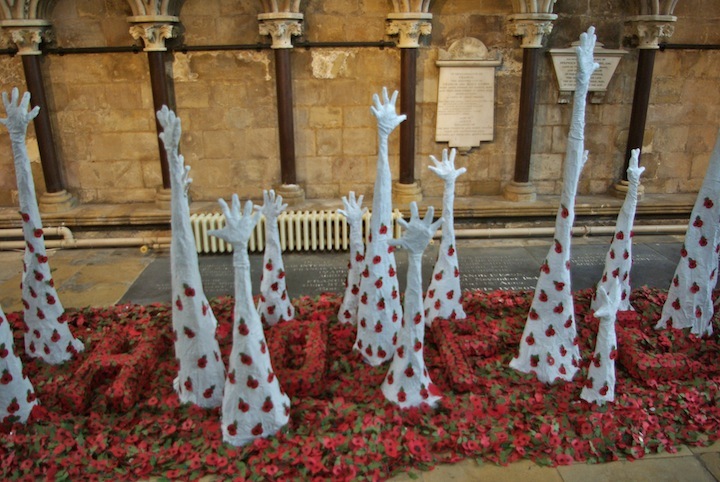 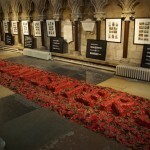 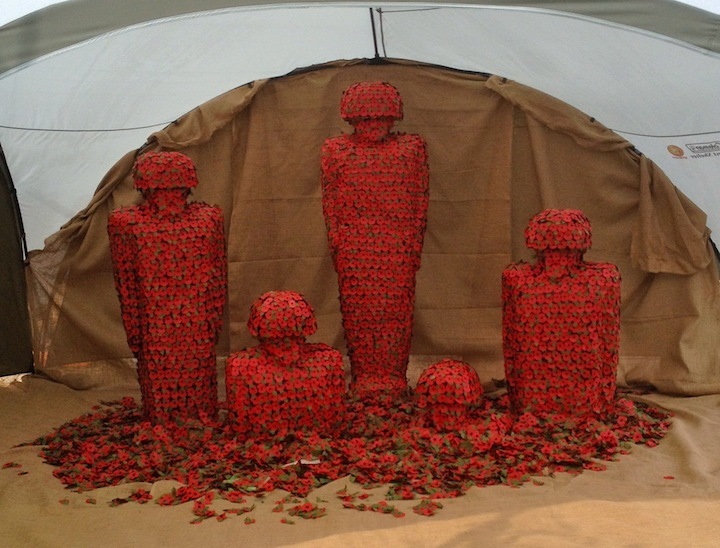 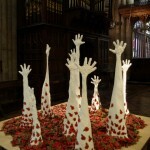 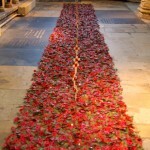 Thank you to everyone for joining with me to help create this artwork of remembrance. 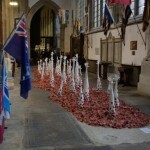 Poppy Cross Installation on the Visit by Holy Trinity Church, Hull. 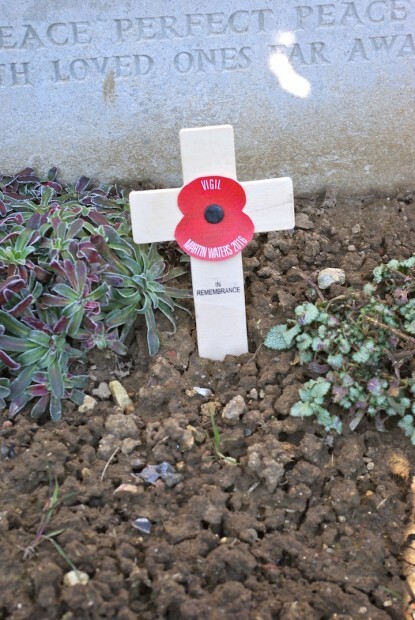 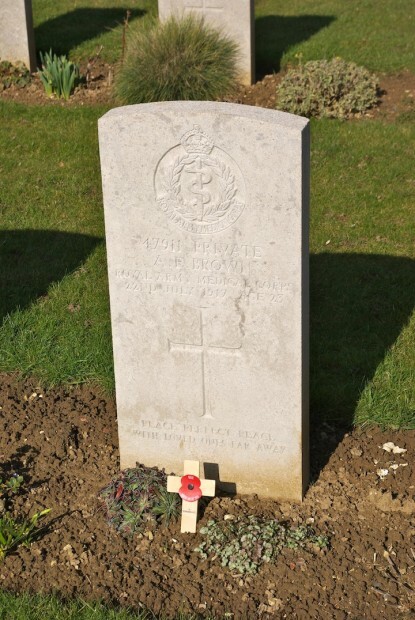 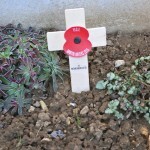 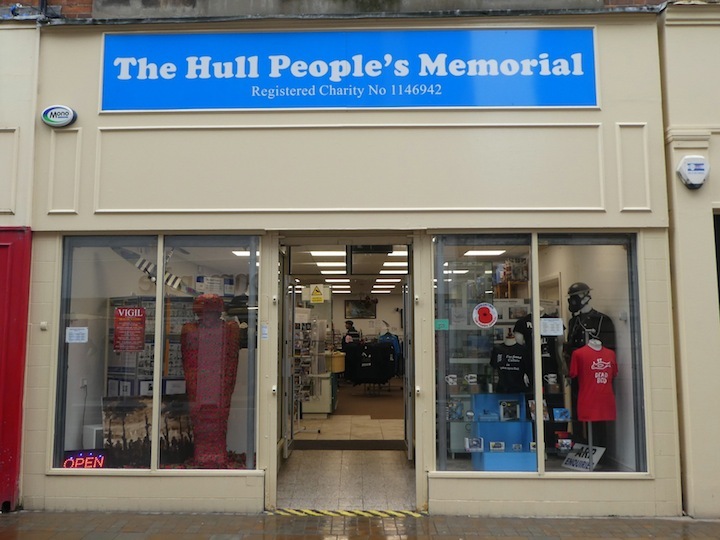 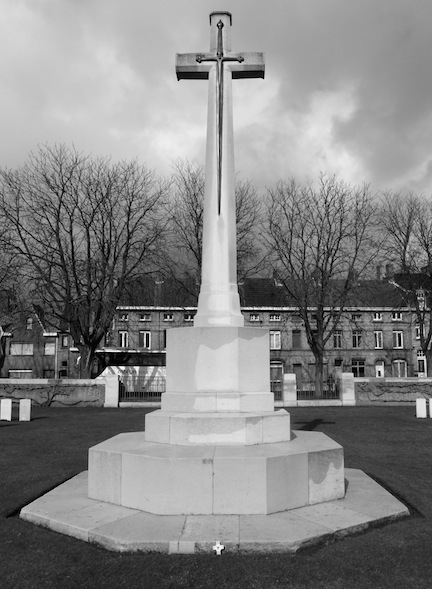 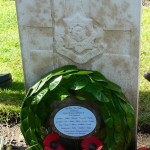 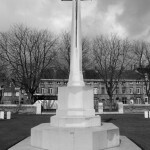 In Memory of Private Charles F McColl a Hull Man who was shot at dawn and recently pardoned. 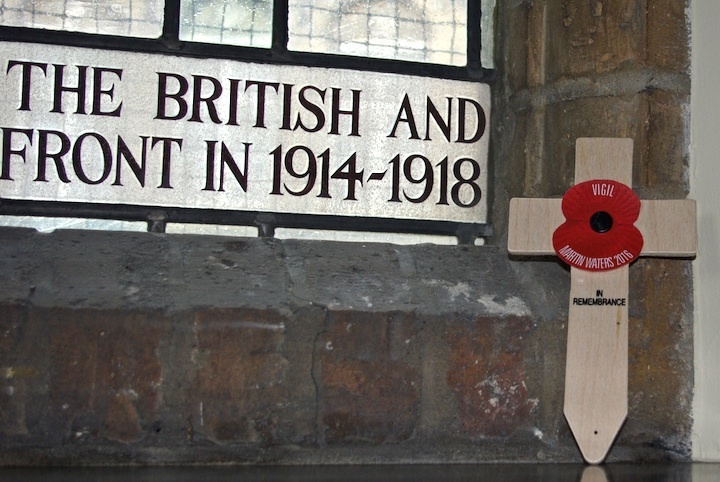 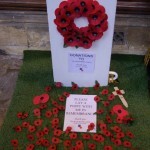 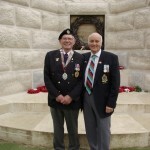 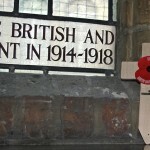 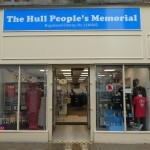 The memorial service was given by members of Holy Trinity Church Hull and The Royal British Legion. 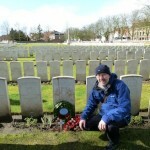 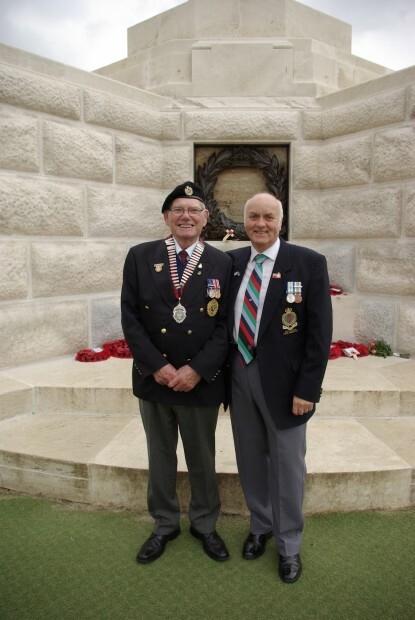 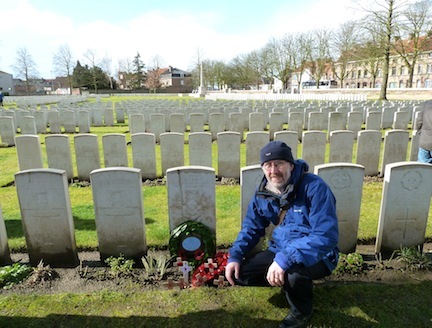 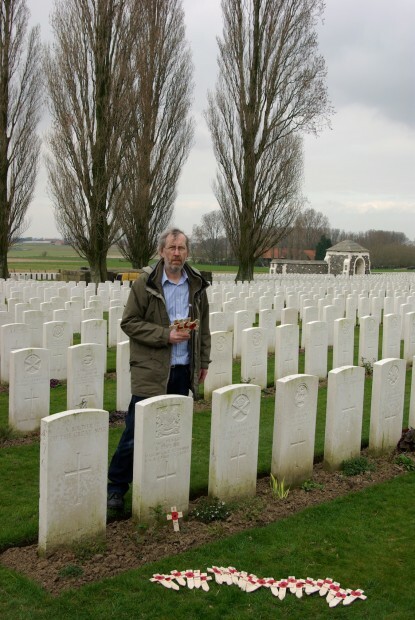 Thanks to the relatives of Private Charles F McColl now living in New Zealand, for their support. 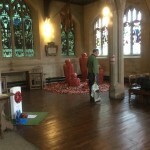 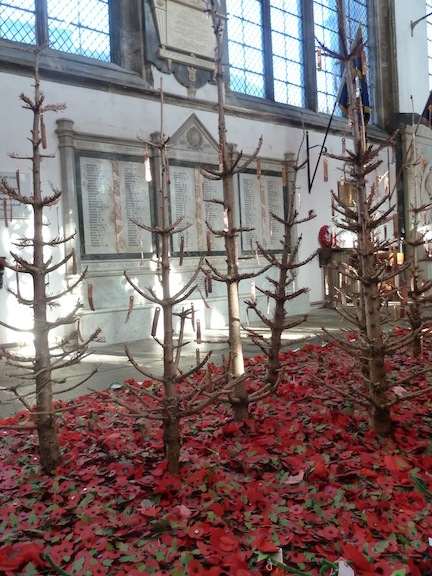 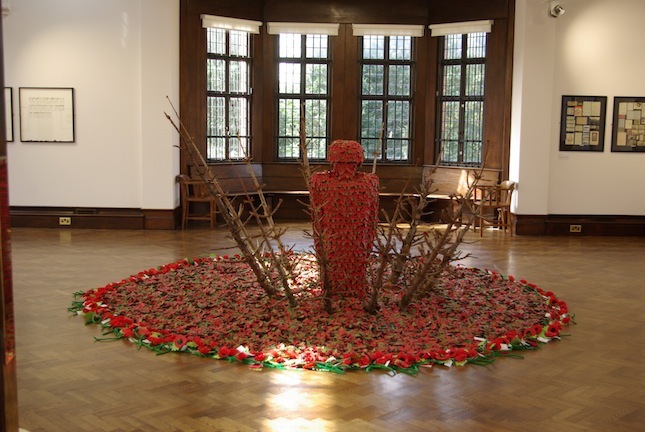 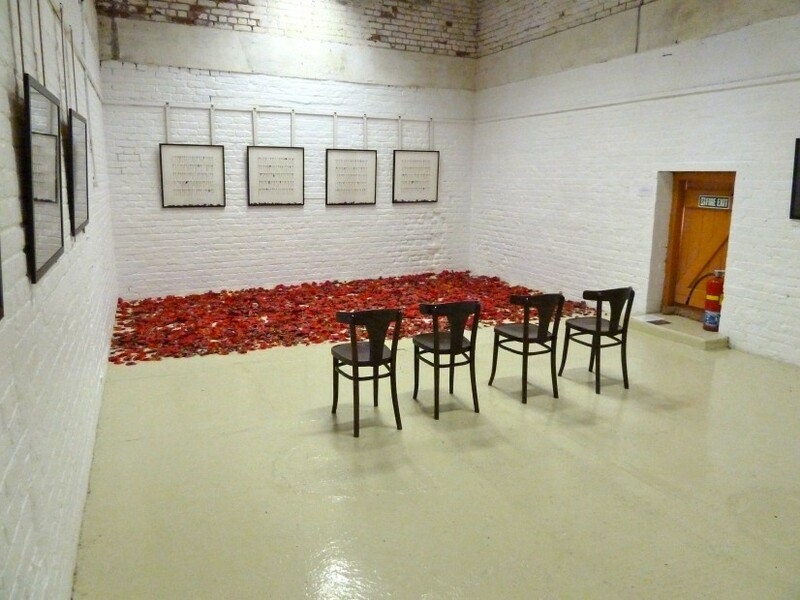 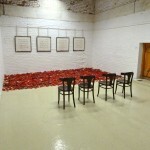 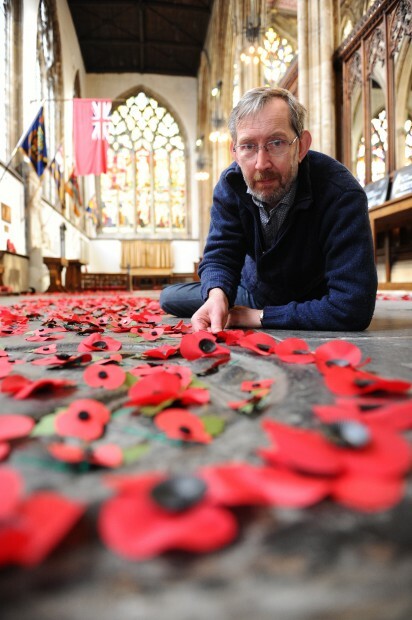 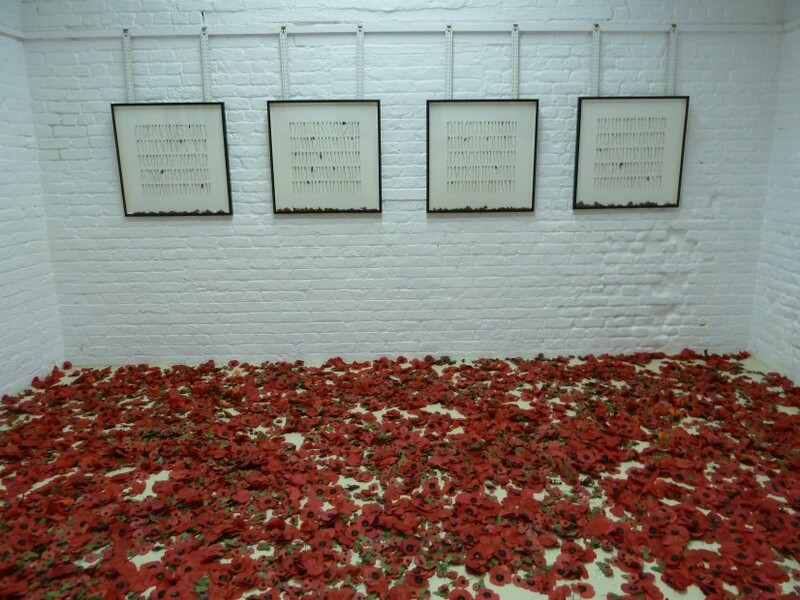 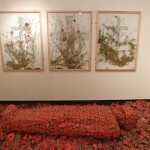 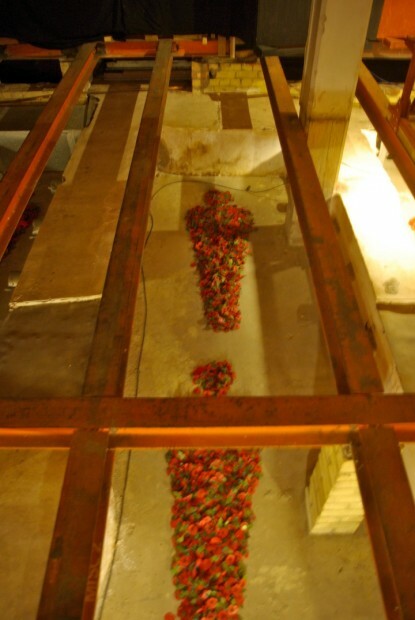 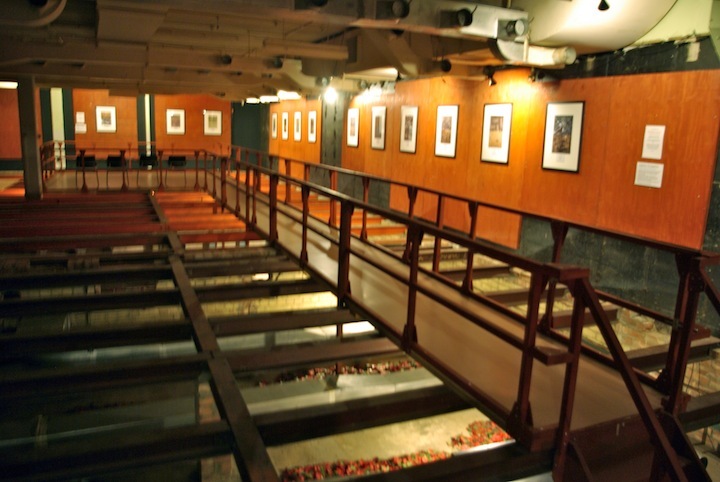 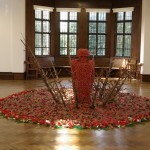 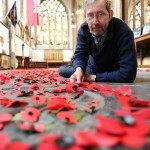 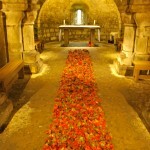 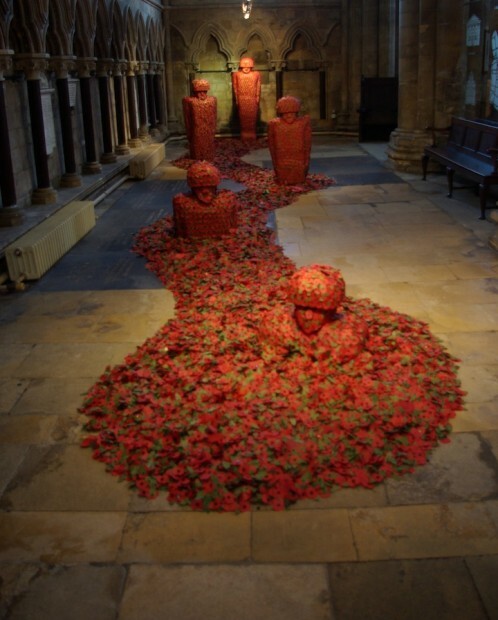 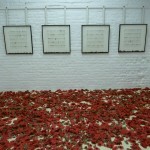 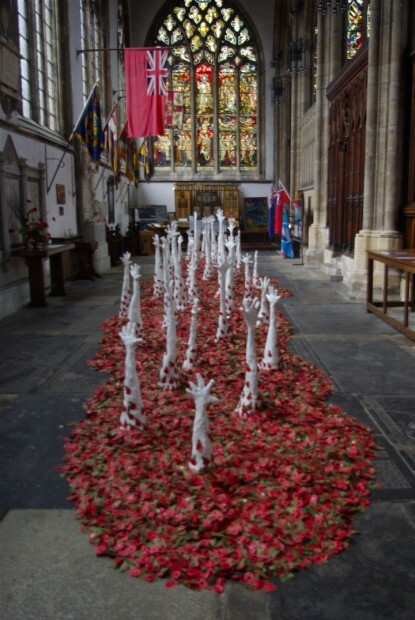 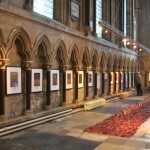 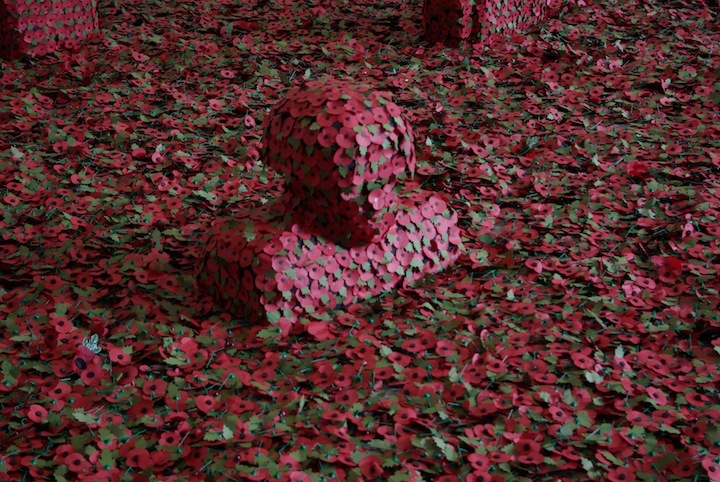 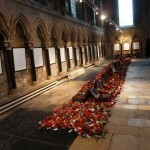 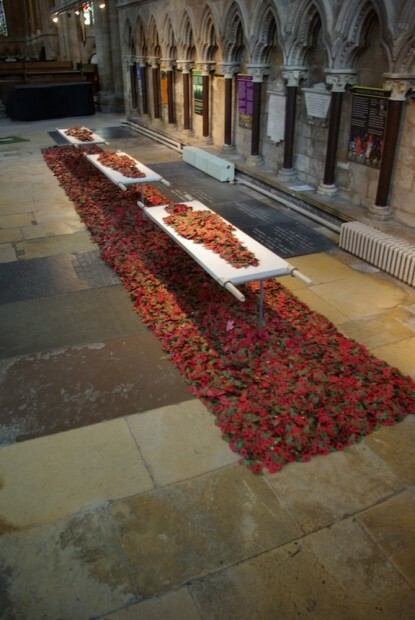 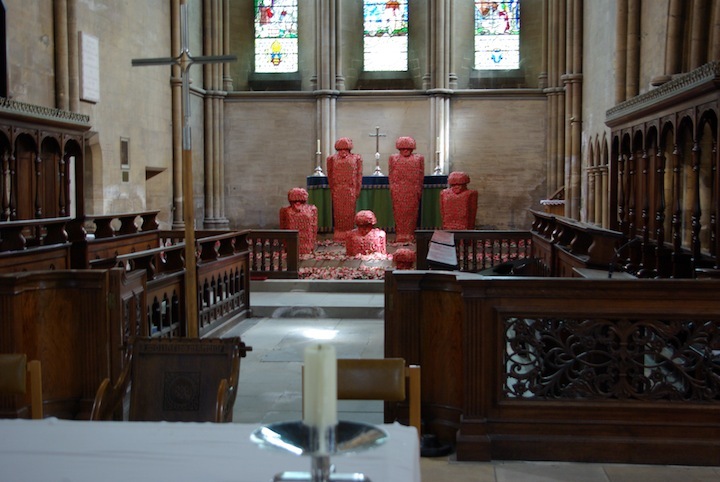 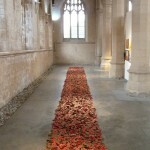 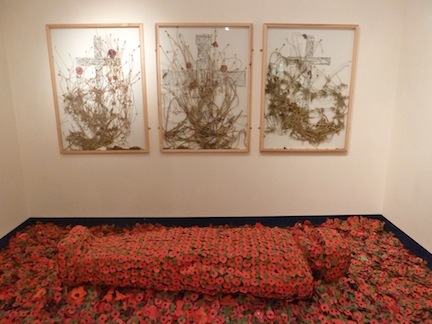 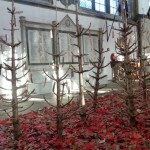 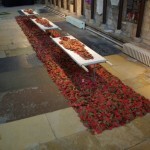 An installation by Martin Waters using poppy crosses placed in areas which have a personal resonance associated with remembrance.